Rajkeeya Engineering College, Bijnor has advertised in THE TIMES OF INDIA newspaper for the recruitment of Guest Faculty / Retd.Faculty Plus Non-Faculty jobs vacancies. Interested and eligible job aspirants are requested to walk-in on 18th July 2018. Check out further more details below. About College: Rajkiya Engineering College Bijnor (Formerly Dr. Bhim Rao Ambedkar Engineering College of Information Technology, Bijnor) was started by Government of Uttar Pradesh, Department of Technical Education under Special Component Plan (SCP), basically a Plan of the Union Government of India for the promotion of technical education into the socially and economically weaker section of the society. The admission to this College started in the year 2010-2011 with three branches viz., Civil Engineering, Electrical Engineering and Information Technology with an intake of 60 in each branch. As a make shift arrangement the classes of the students admitted to this college were being organized in Harcourt Butler Technological Institute Kanpur. 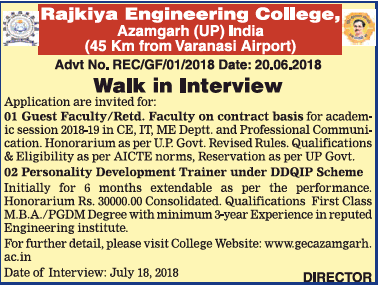 How to Apply: Interested and eligible candidates should appear in the interview along with their duly filled in and signed application form available on college website along with Demand Draft of Rs 500/- in favor of Director, Rajkiya Engineering College, Azamgarh payable at Azamgarh. All interested are required to report on scheduled date half an hour before scheduled time along with One set of attested copies of the degrees, mark-sheets, experience certificate etc. in the office.